Pulse width trigger allows triggering on positive or negative pulses shorter or longer than a specified time. To trigger on a pulse, the scope uses two levels to determine the flanks of the pulse the same way as rising and falling edge triggers. 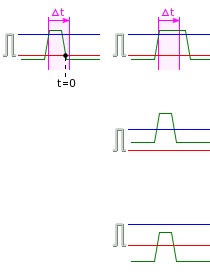 The trigger condition parameter determines whether the pulse must be shorter than or longer than a trigger condition time parameter, or inside our outside a trigger condition time frame to cause a trigger. 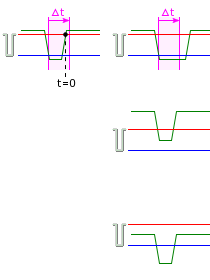 When using Positive pulse triggering, the system triggers when the input signal contains a positive/rising pulse that crosses both levels, first in upward direction and then in downward direction. When one of the levels is not crossed, no trigger occurs. When using condition Shorter than in combination with Positive pulse triggering, the system will trigger when the signal contains a positive pulse that exceeds both levels, shorter than the specified time. The time interval starts as soon as the leading edge of the pulse is detected. When the pulse is longer than the specified time, or one of the levels is not crossed, no trigger occurs. When using condition Longer than in combination with Positive pulse triggering, the system will trigger when the signal contains a positive pulse that exceeds both levels, longer than the specified time. The time interval starts as soon as the leading edge of the pulse is detected. When the pulse is shorter than the specified time, or one of the levels is not crossed, no trigger occurs. 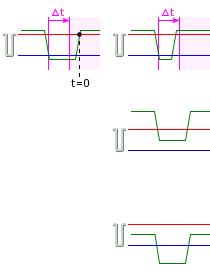 When using condition Inside in combination with Positive pulse triggering, the system will trigger when the signal contains a positive pulse that exceeds both levels, with a pulse width inside a specified time frame. The time interval starts as soon as the leading edge of the pulse is detected. 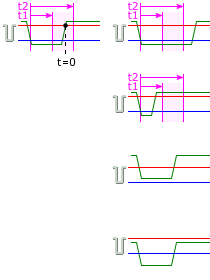 When the pulse width is shorter or longer than the specified time frame, or one of the levels is not crossed, no trigger occurs. 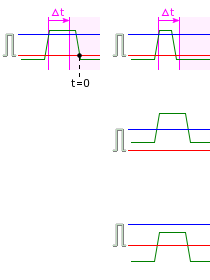 When using condition Outside in combination with Positive pulse triggering, the system will trigger when the signal contains a positive pulse that exceeds both levels, with a pulse width shorter than or longer than a specified time frame, in other words outside a specified time frame. The time interval starts as soon as the leading edge of the pulse is detected. 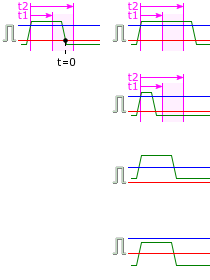 When the pulse width is within the specified time frame, or one of the levels is not crossed, no trigger occurs. When using Negative pulse triggering, the system triggers when the input signal contains a negative/falling pulse that crosses both levels, first in downward direction, then in upward direction. When using condition Shorter than in combination with Negative pulse triggering, the system will trigger when the signal contains a negative pulse that exceeds both levels, shorter than the specified time. The time interval starts as soon as the leading edge of the pulse is detected. When using condition Longer than in combination with Negative pulse triggering, the system will trigger when the signal contains a negative pulse that exceeds both levels, longer than the specified time. The time interval starts as soon as the leading edge of the pulse is detected. 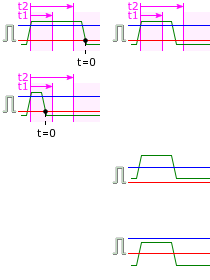 When using condition Inside in combination with Negative pulse triggering, the system will trigger when the signal contains a negative pulse that exceeds both levels, with a pulse width inside a specified time frame. The time interval starts as soon as the leading edge of the pulse is detected. When the pulse is shorter or longer than the specified time frame, or one of the levels is not crossed, no trigger occurs. When using condition Outside in combination with Negative pulse triggering, the system will trigger when the signal contains a negative pulse that exceeds both levels, with a pulse width shorter than or longer than a specified time frame, in other words outside a specified time frame. The time interval starts as soon as the leading edge of the pulse is detected.